Want one-on-one coaching, but don’t have the time or budget? Maybe you’re just starting out with high performance driving, and you’d like some instruction? Or you want to improve your mental game behind the wheel? Click here to learn more about my Performance Driving 101 and Inner Speed Secrets 201 eCourses, where you can learn in short, digestible modules, at your own pace, at home or at the track, on a laptop or a smartphone. It doesn’t get any easier than this to prepare for your next day at the track, and take your driving performance to an all-new level. In the past, I would not have believed that a driver could learn so much through an online program. But having seen the results – and what we can do when creating an e-Learning program – I’m totally convinced of how effective an eCourse can be. What Can A Driver Coach Do For You? There’s a huge difference between coaching and instructing. If you’re looking for basic instruction – for example, if you want someone to tell you where the apex of a corner is – I may not be your guy. Sure, I can do that. But my expertise goes beyond that. My approach to coaching is to do whatever it takes to make sure you perform better. If that means pointing out where the apex of a corner is, sure I’ll do that. But I’d rather help you learn how to figure out where that apex is on your own, so you don’t have to rely on me forever. I call this learning from the inside-out, rather than the outside-in. My goal is to help you develop and improve as a driver, in all areas: your speed, your racecraft, your consistency, your ability to sense what your car needs to make it perform better, how to be more effective outside of your car (working your team, media, whoever), and so much more. My coaching process starts by getting a clear understanding of your strengths and weaknesses, and developing a coaching plan. 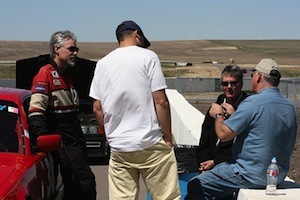 Then there’s the actual coaching at the track, and finally, a written report reviewing everything you learned and the areas for further improvement. If you want a quick hit – someone to come in and tell you what he or she would do if they were driving your car, then go for it. But that’s not my approach. If you want a coach to help bring out your best, and to help you develop as a driver, I’m your guy. There’s no cookie-cutter approach here. Each coaching program is custom-designed, as your needs are different from other drivers’. What high-performing person improves without some form of coaching? Athletes in every sport have coaches – do you? Whether you’re just starting out in track day events, club racing, or pro racing, whether you’re young or old, whether your goals are simply to learn the limits of your car better or you’re embarking on a professional career, I will adapt my coaching to your needs. No level or type motorsport is out of the question for me. I seem to be one of the most sought-after and busiest driver coaches in the world, so I guess I’m doing something right. For groups of 2 to 4 drivers, I will customize a coaching session to help each driver achieve his goals. The group of drivers can have similar cars, or a variety; on-track sessions can be all at one time, or separate. A Group Coaching program typically involves both on-track and off-track (classroom-type) sessions; the off-track sessions are geared to set specific objectives and tasks for each on-track session, followed up by a debrief. If football teams practiced the way most drivers do, they would show up to a practice session and play a game. But they don’t. They break the game down into discrete skills, such as blocking, tackling, and passing; they practice those skills until they are near-perfect. Then, and only then, do they put them together in a game setting. What if you approached your development in the same way – the way scientific research recommends? Natural talent is just one part of whether you achieve your driving/racing goals or not. It’s what you do with your natural talent that makes the difference. My approach to driver development is strategic, developing a driver’s natural talent in a deliberate way. Not just seat time. The right type of seat time. And not just driving technique. My coaching covers all aspects of being a driver: for amateurs, it’s focused on fun, learning, improving, and achieving one’s desired goals; for pros, it’s everything from getting the most out of the car on the track to communicating with the team, plus the physical and mental training approaches to a driver’s marketing and career skills. I look at my role as being a strategist as much as I am a teacher, instructor, facilitator and coach. Many instructors can help you get seat time, but it’s what you do with your seat time that matters most. Drivers require strategic and deliberate coaching. What’s driving your car? It’s not your hands, arms, legs and feet, despite it seeming so. No, it’s your brain. Your mind tells your eyes where to look, and then they transmit information back to your brain. Same with your sense of feel and hearing. Your brain tells your limbs what to do – when and how much to turn the steering wheel, to apply or release the brakes or throttle. 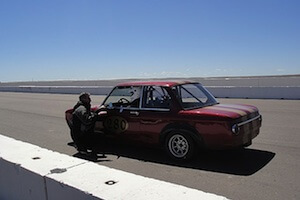 Performance or race driving is more of a mental activity than it is a physical one. Sure, it takes strength and endurance to drive for any length of time on a track. But it’s your ability to focus, process information quickly, mentally “see” what you need to do next, automate your skills and techniques, make good decisions, know when to dial up or down your patience level, and get into that almost mystical state called “the zone.” That’s what makes our sport so challenging and frustrating at the same time, and what brings us back over and over again. If you’ve ever wanted to improve your “mental game” in driving, I can help. I’ve studied sports psychology, human learning factors, educational kineseology, and coaching techniques, combining the critical components into a program that helps drivers perform at a higher level more consistently. I call this Inner Speed Secrets, and it’s a unique part of every coaching program with every driver I work with. It’s what gives “my” drivers an edge over others. What are your fees for coaching? One-on-One Coaching: $2250/day for the time I spend at the track. Preparation (phone conversations, questionnaires, video/data review, pre-coaching plan) and post-coaching reports are all included in that, as is my travel time. What isn’t included are my travel expenses, which are charged without any markup. Group Coaching: For two drivers, it’s $4000/day ($2000/driver); 3 drivers is $5250/day ($1750/driver); 4 drivers is $6000/day ($1500/driver); travel expenses are in addition. I rarely take on more than 4 drivers without the program switching to a special program. Contact me if you’re interested in larger groups. For coaching engagements that require me to travel (One-On-One and Group Coaching), fees are charged on a day rate, plus travel expenses. The day rate is only charged for the actual days at the track, coaching. Additional time that I spend, including the initial assessment, phone conversations, travel time to and from, and any written reports are covered under the at-track fees. In other words, you only pay for the days that I’m at the track coaching you, plus my actual travel expenses. We require 50% of the total coaching fee up front to confirm the date(s), and then the balance along with all expenses paid by invoice within 15 days after the event. Overseas coaching engagements require full payment prior to the travel. Will you ride in the car with me? My attitude towards coaching is “Whatever it takes,” and sometimes that means riding in the passenger seat, or driving the client’s car to set a baseline for data. Having said that, too many coaches are far too quick to hop in the driver’s seat (getting to drive seems to be their prime motivation, rather than being there to help you learn and improve). And often, coaching from the right seat only provides a short-term fix, whereas working with you in other ways helps long-term. Riding, driving, observing from a corner, analyzing data and video, talking to you on a radio, or using one of my other strategies are all the various tools I use to help you achieve your goals. Email me for information or to book your coaching session.